The Wenstrops have it all: health, wealth, and happiness. Until everything falls apart. Helen gets arrested for murder, and yet is either unable or unwilling to give a defence. During her detention, vital evidence goes missing and tensions run high. Meanwhile, in the woods, malignant forces gather power. If I knew nothing about this book and only saw the cover, I’d want to read it based on that alone. Being a King fan, when I read this book had ‘faint echoes of Pet Sematary’, I was a goner. In most horror movies and books, when the supernatural occurrences begin in a house, you wonder why the owners don’t just vacate the premises. Find a new house with no previous owners. Preferably not one on an Indian burial ground. But Helen doesn’t have that option – if she leaves, her terminal cancer returns. So then what happens? She deals with it – sometimes in very vivid and graphic ways that made this horror fan smile and nod in pleasure. 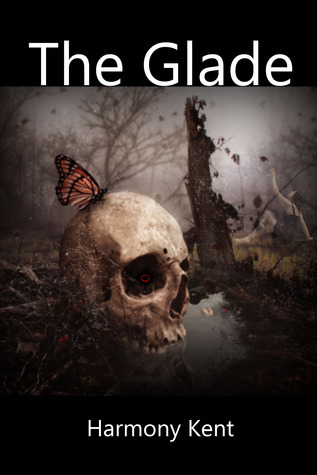 The Glade is an exciting blend of horror, thriller, and mystery, tossing in unexpected twists along the way to keep the reader guessing. The alternating timeline narrative adds to the suspense, and the setting descriptions are eerie and mystical. If supernatural suspense is your thing, this is your book. I agree with you, Teri. This one kept me turning the pages. It was a great story. I had to take a break reading it for other commitments, but was able to pick it back up with no problem – the story really stuck with me. You’re welcome, Harmony – such a suspenseful read. Hope you feel better! I read this one a while back and enjoyed it too. Not surprised – seems like something you’d like, Craig. I read The Glade some time ago and found it gripping from the highly-charged opening scene. Great review, and congrats to Harmony! Thanks, Mae – can’t believe it took me this long to get to it. Hindsight and all that. Great review, another one I have to try! Just keep adding to that pile, Jacquie! Ooooo… well done Teri. This sounds like a winning combination, and you certainly made me want to read it. best to Harmony. Hugs. Definitely a suspenseful one, Teagan – will keep you turning those pages. Hugs! The cover’s a winner for sure, Mischenko – happy reading! Um, just as well you don’t need your beauty sleep, John, cos this one will keep you awake, lols! 😃. I’m so thrilled with this review! I would be as well. A lovely review of Harmony’s book, Teri. I am also a King fan. Thanks, Robbie – and we definitely share the King interest. An awesome review to share, Teri. Thank you!